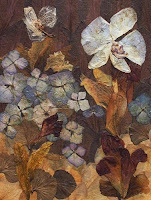 Another collage made from flower petals, giving the flowers a second life. Lots of great texture and some color. In this one there are orchid, hydrangea, rose, clematis, weigelia and probably a few other types of flower petals.